This Mini Bouncer can accommodate 4-7 children, and will entertain them for hours. 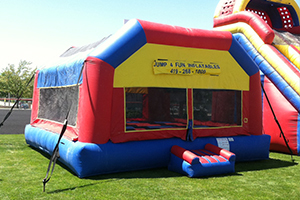 Mini Bouncer is 15’x15’ in size. 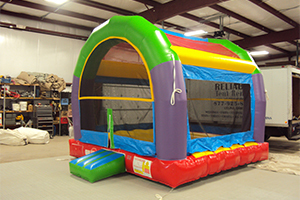 Our 20’ x 20’ Jumbo Funhouse is a must for all large events and will accommodate up to 15 kids at once. The funhouse also includes 2 basketball hoops for added fun. This slide is a screamer! Kids and adults love it, and so will you. Great for parties, picnics, or any other outdoor event. The slide is approximately 33′ long, 15′ wide, and 24′ tall. The obstacle course is designed for maximum fun and versatility. 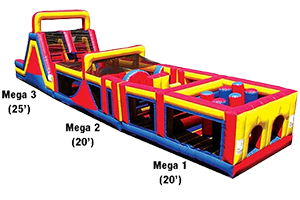 You can mix and match the 3 sections to create a 65′ long obstacle course or used modules 1 & 2 for an exciting 40′ course You can also combine 1 & 3 for a challenging 45′ course. 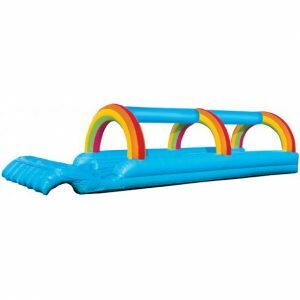 Wave Runner Slip N Slide is a guaranteed way to satisfy those who enjoy cooling off with water slides. A two-lane slippery slide that spans 35 feet in length. 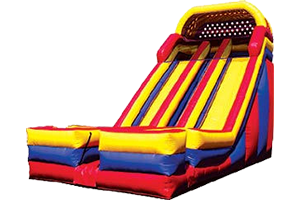 Features high inflatable walls to ensure the safety of sliders. With two lanes, the Wave Runner Slip N Slide doubles the fun and allows for fun competition among sliders.